where I'm playing... tell them! *these shows are with the fabulous CHARLIE KING!! his wife, Monique, were on hand to help with the celebrations. 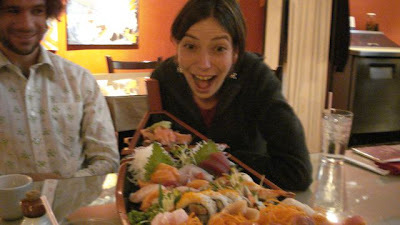 Amy's 27th birthday party sushi boat! experience and I learned so much there. From Portland, on to Malmo, Sweden for the EUROPEAN SOCIAL FORUM. patriarchy... it was a BLAST. and help here in Denmark. between Norfolk, VA and Atlanta, GA on November 17th. If you could host me and Charlie for a show, that would be great!! but, I've got to leave for the airport now! history, the poetry, the politics!! YES!!! Come along in 2009.
mailed upon receipt of payment -- so please reply promptly. and seating will be available at 7:00 p.m.
speeches, letters and anecdotes, a vivid living portrait emerges. of Television and Radio Artists. R.J.'s website: www.rjlindsey.com. House of Grass Valley, CA. Anne Feeney and Charlie King - EARLY SHOW!! Why the Media Blackout on violence against Journalists at the RNC? Subject: This is America. We don't jail journalists here. Jailing journalists is unacceptable in a democracy. But that's exactly what is happening at the Republican National Convention in St. Paul, Minnesota. Award winning journalist and host of "Democracy Now" Amy Goodman was arrested by St. Paul police while covering a protest outside the Republican National Convention. Though clearly identified as press, Goodman was charged with "obstruction of a legal process and interference with a 'peace officer.'" Two of her producers were arrested for "suspicion of felony riot." To tell you that this arrest was brutal and upsetting simply doesn't do it justice. Watch this video to see for yourself. Then take action. I just e-mailed the presidents of CNN and NBC News (which oversees MSNBC) to demand that their networks cover this important story. I hope you will too. PLEASE come to my Oregon gigs and/or tell your friends to come! an urge to travel I've got a fantastic offer for you. know if you'd like us to come to your town. Myshkins are all on the scene. to attract the women's vote! a great family weekend in Kerrville! miles from his hometown of Smedjebacken. terrible fall in Denton, TX just before this year's festival. could not do this without you! Anne Feeney in Concert with Brian QTN!!! I leave for Ireland on September 29th.